I don’t have the craftsmanship of the scraper bike artists, but since I lack a yard or street-facing windows, I had to do what I could. In a mostly depressing election season, Raburn’s run for the BART Board in District 4 (encompassing Alameda and about half of Oakland) is one of the few bright spots. He is well-qualified for the position, with an academic background in transportation and urban planning, and a long history of public action on urban transportation issues. 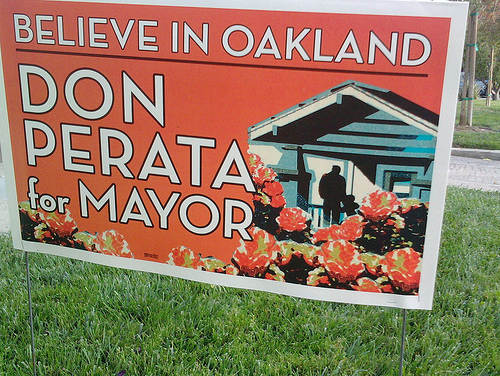 He also offers a stark choice between competing visions for what BART should be. Carole Ward Allen (the incumbent) and most of her fellow directors prioritize grandiose but imprudent projects like the Oakland Airport Connector and expensive expansions to far-flung suburbs, where ridership consistently fails to meet BART’s projections. Raburn, in contrast, wants to refocus BART’s priorities on core services, putting more resources into increasing reliability, decreasing headways, decreasing blight in and around stations, and improving passenger connections between BART and other modes of transportation, whether they be bus or bike or pedestrian. Raburn has his work cut out for him. Not only is Carole Ward Allen a 12-year incumbent who is deeply embedded in the East Bay political machine, but Raburn is pushing back against 40 years of BART history. The sad fact is that BART has always acted more like a commuter rail system than an urban subway system, so Raburn’s focus on strengthening core services in the bay area’s most densely populated areas is surprisingly revolutionary. It may be an uphill climb, but Raburn does have some things going for him. 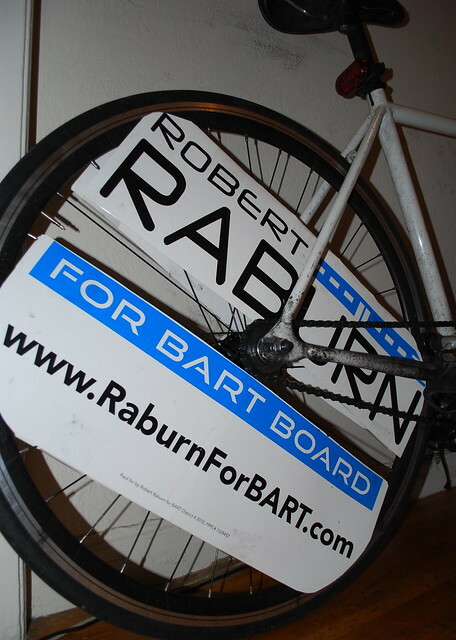 As the longtime director of the East Bay Bicycle Coalition, Raburn has very active support from the cycling community (see the photo above for an example—and I picked up that yard sign at a supportive bike shop in Alameda). 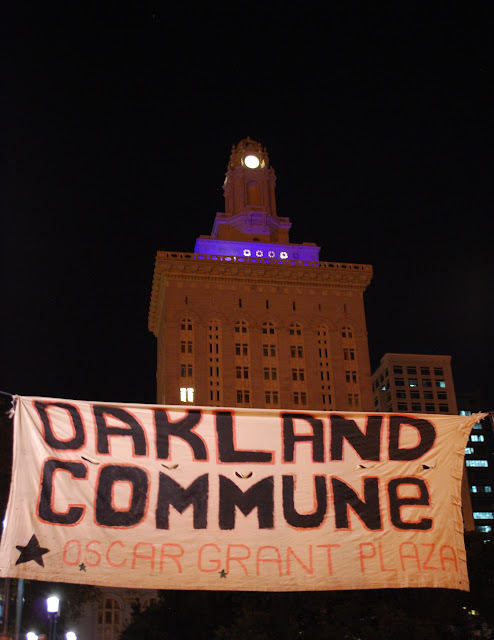 He will also benefit from the highly motivated, highly organized opposition to the misguided Oakland Airport Connector—there are a lot of people like me who never paid any attention to the BART board before, but who are now more eager to vote for a BART director than anyone else on the ballot. The airport connector, which will likely provide worse service than the current AirBART bus, but at twice the cost to passengers (and a cost of almost $500 million to BART) is not only a strong argument against Carole Ward Allen, who championed the project, but it also offers a more general lesson on why these down-ballot elections are important. Advocacy groups such as TransForm (not to mention a veritable army of local bloggers) fought heroically to get BART and the Metropolitan Transportation Commission (MTC) to reconsider their plan to endanger BART’s financial future by taking out loans to fund a wasteful and unnecessary tram, but ultimately the MTC deferred to the BART board and approved the project. The airport connector is a prime example of why it’s more efficient—and effective—to elect the right people to these positions in the first place, instead of having to fight long, difficult battles over every lousy project. Personally, I think Quan should be pretty embarrassed that the Tribune put a City Council neophyte and a college professor with no political experience above her on their list of recommendations, but I suppose that the two most common ways of dealing with embarrassing facts are to ignore them, or to deny them. As political half-truths go, I don’t know where on the scale this falls—it depends on what the meaning of “endorse” is, as Bill Clinton might say. (The Guardian’s endorsement does explicitly say that they are “endorsing” both Kaplan and Quan, even though they recommend making Kaplan the first choice vote and Quan the second.) 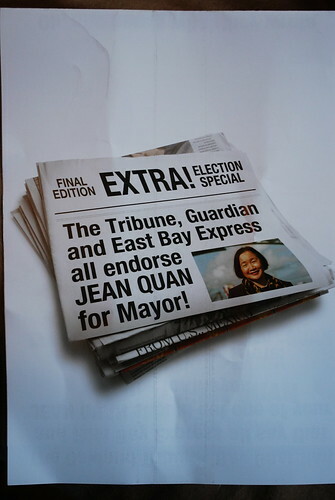 The inside of Quan’s mailer is less misleading, saying that “The Oakland Tribune, Bay Guardian and East Bay Express all say that JEAN QUAN should get one of your votes for Mayor,” and pointing out that all three papers specifically criticized Don Perata. Politics as usual, or over the line? That probably depends on how one feels about Quan in the first place. I’ve made it pretty clear on several occasions in the past that I am not impressed at all by Quan, so unsurprisingly, I’m not impressed by this mailer either, but I suppose that if one sees this race (and she hopes that we will) as a two-candidate horserace between her and Don Perata, then it’s perhaps less misleading to claim that she has been “endorsed” by the Trib and the Guardian.